I had every good intention of writing this review the day after the D.T.W.C meeting No. 4, but true to the Greybush legend – it never happened. In an attempt to redeem myself and demonstrate to all that I am not that big a procrastinator, I submit this review. My search for a full cask strength whisky started after I had purchased a bottle of Laphroaig 10yo Original Cask Strength (duty free) prior to my departure from Christchurch airport, 12 months ago. It was a taste sensation not easily forgotten (not to mention the 58 plus percent alcohol content). 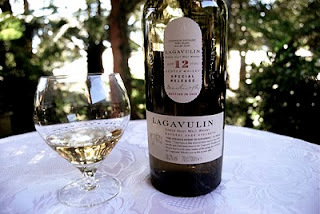 As I was unable to purchase the Original Cask Strength Laphroaig in Australia I started to look around for something as close as possible to the Laphroaig I enjoyed so much. Hence the purchase of a bottle of Lagavulin 12yo Natural Cask Strength. It has the same attributes as the Laphroaig, including the same alcohol content. A little bit of research on this whisky produced the following. The Lagavulin distillery is located on Islay, right next door to the Laphroaig distillery. In their early days there was a strong association between the two distilleries until a serious difference of opinion occurred. A war between the two distilleries developed in which Lagavulin managed to wisk away the still master from Laphroaig. Hence the similarity in the style of whisky between the two. The whisky is a 12 year old special release, bottled in 2004. It is a natural cask strength boasting an alcohol content of 58.2 percent, good enough to put hairs on anyone's chest. The whisky comes in a dark green bottle and I was surprised at the pale straw colour when poured into a glass. My first impression was 'It can't be a strong whisky – judging by it's colour.' A little bit of swilling and hand warming showed the whisky climbing up the side of the glass – a testimony to it's high alcohol content. When sniffed, it was reminiscent of smoke as well as peat. It instantly reminded me of the aftermath of a bushfire. The taste was reminiscent of barley and citrus which developed into flowery and bright spice notes. This whisky does not impose but leaves a lasting impression. Incidentally, this whisky was a favourite of the late Michael Jackson who expounded it's virtues at every possible chance. Having tasted it – I'll certainly be purchasing another bottle – just to see if the second bottle is as good as the first one. I give this drop a rating of 6 out of 7!